These cookies are addicting . . . so use caution! 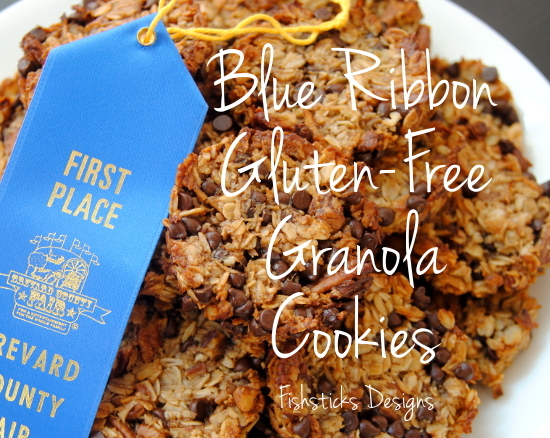 I spent some time experimenting with granola bar recipes and breakfast cookie recipes a couple of months ago in an attempt to come up with a recipe for a healthy-ish snack that I could take along to Allen’s track meets. It had to be something that uses real ingredients, it had to have chocolate and it needed to be gluten-free. 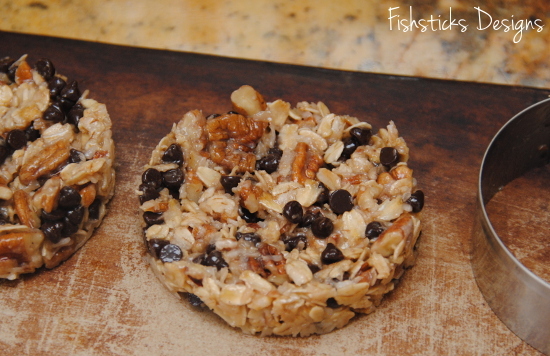 What I ended up with is a recipe that is shaped like a cookie, but has the texture and taste of a granola bar. 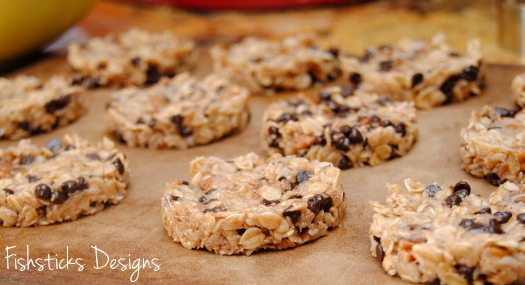 (My kids actually call these Granola Circles.) Everyone who has tried these has enjoyed them so much, I couldn’t resist baking up a batch and entering it into our county fair. And, it won a first place ribbon! Preheat oven to 350 degrees. 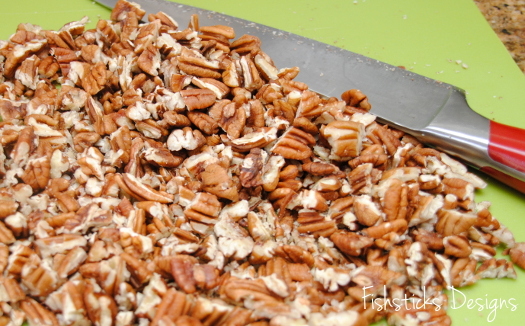 Coarsely chop your pecans. 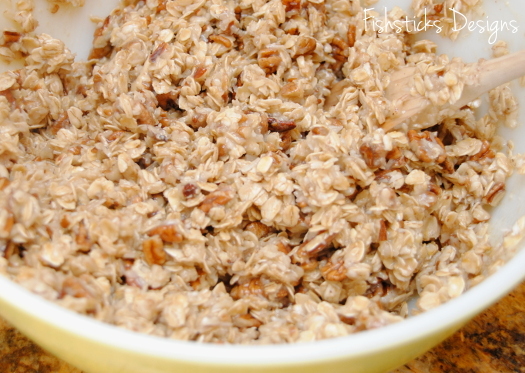 In a large bowl, mix oats, coconut, sea salt and chopped pecans. 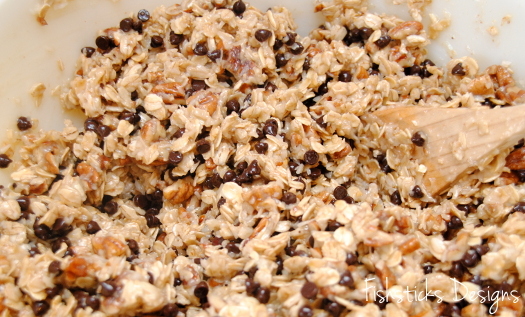 Pour in the mini chocolate chips and mix it all well. Feel free to taste the “batter” and see what you think, but don’t eat it all! Grab a cookie cutter and place it on your baking stone or on a baking sheet covered with parchment paper. I use a 2 1/2″ circle cookie cutter, but any cookie cutter in a similar size and shape will work. (Maybe hearts for Valentines Day or Christmas trees in December? How fun would that be?) Scoop out about 1/4 cup of the cookie batter and press it into the cookie cutter really well. It should end up being about 1/2″ thick. Carefully remove the cookie cutter, leaving a perfect little circle (or heart or Christmas tree) behind. Repeat until you’ve filled up your baking sheet. Bake for 24 to 27 minutes or until they’re golden brown. Mine are always perfect right at 26 minutes. Slide the cookies off onto a wire rack to cool. You can eat them warm, of course, but I think they’re best when they’ve cooled to room temperature! I would love to hear your feedback if you give this recipe a try! 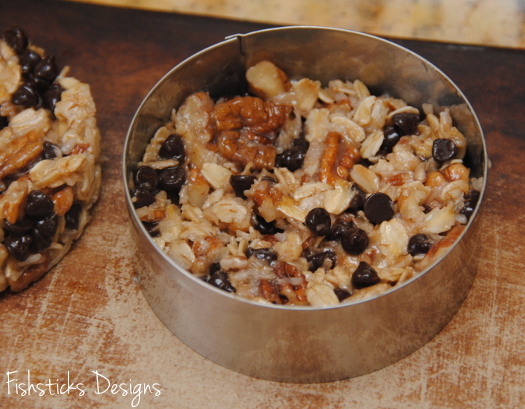 I’m thinking that it would be just as yummy if you substituted dried fruit for the chocolate chips and any other chopped nut for the pecans. 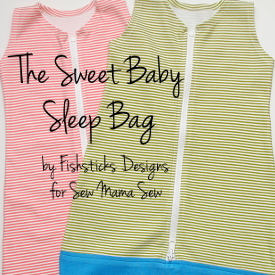 I’ll be making a big batch for our family trip next month! Hey Bonnie. 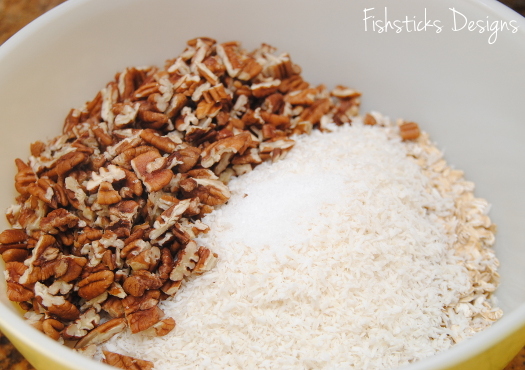 What would you substitute for pecans/nuts if you were nut free? 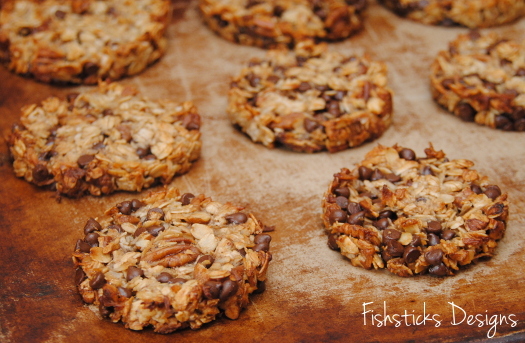 I am an appalling cook, and am desperate to make my kids healthier alternatives to cookies. Also- if you have any breakfast buns/muffins recipes to share, that would be brilliant too. I actually have quite the collection of real food recipes, now, and I really need to add them to my sidebars so they’re easier to find! 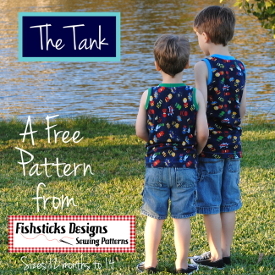 You can scroll through all of them by clicking here: http://fishsticksdesigns.com/blog/category/real-food-recipes/ You should find a couple of quick bread/muffin recipes and a yeast bread recipe! I hope that helps! These look amazing! I can’t wait to try them. Congratulations on first place! How exciting!!! Congratulations! These look soooo yummy too! 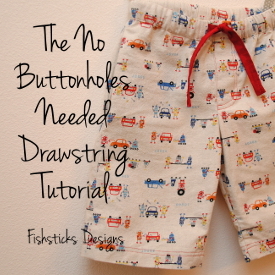 I’ve pinned to hopefully try them soon! I know my crew would love them! Oh, Yummm! 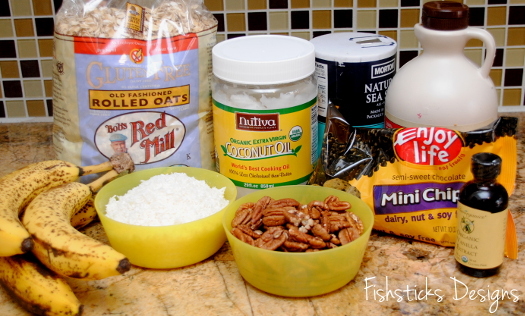 I have these ingredients (well, except for the walnuts and coconut, but still close :)) We’re going to love these! I’m so glad to finally put a face, blog and name to your Instagram ID. I’m adding you to my Feedly account now. Hi, Shannon! 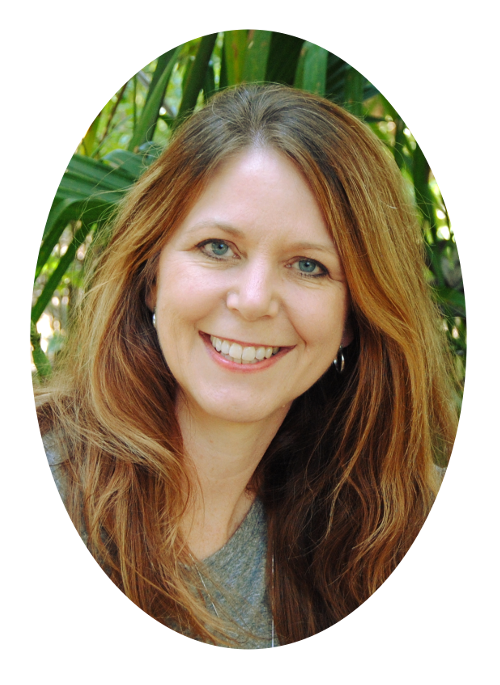 I’m so glad that you found your way over to my blog! I LOVED reading yours last night, and I’m following on Bloglovin’ now! I made these just this morning. I substituted honey for maple syrup, and rice bran oil for coconut oil. They turned out great! Yay! I’m so glad to hear that! Enjoy! YES! Making these tomorrow. I make a batch of granola bars every Sunday for snacks and post-workout fuel for the week. This will be nice to add to my rotation! Oh boy. 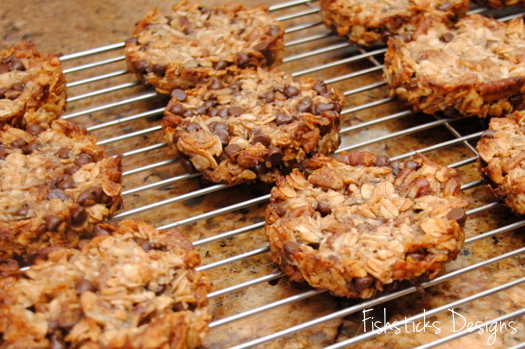 These definitely fall under the cookie category! I think I might wrap them up and put in my girls’ “treat bin” at school for when classmates bring in birthday treats! SO yummy! Only changeds I made were honey instead of maple syrup, no nuts, and a few butterscotch chips added in for good measure! Thanks for the recipe. these sound perfect! 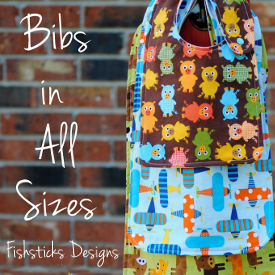 I will be doing up a batch this week. We will have an extra 6 children for a babysitting sleepover. I am sure I will be a huge hit! Thank you very much! If I wanted to only use gluten free flour and the gluten free oats how would I substitute the coconut oil, bananas and maple syrup for eggs and sugar? Hi, JJ! Those ingredients are really the base for the recipe. I don’t think you could substitute them and have a similar end product. Our family doesn’t eat sugar, so it’s not something that I can experiment with for you. I really recommend searching Pinterest to see if you can find a similar recipe that uses the ingredients that you prefer. Yummy. I baked them in the Calphalon Dessert Bar pan. Easy. Muffin tins would work as well, they would just be smaller and require less baking time. Thanks for the great GF and refined-sugar free treat!